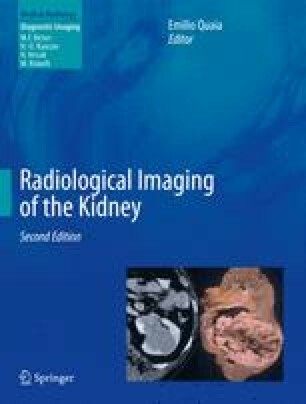 The aim of this chapter is to illustrate the typical imaging findings and the features of the main pathologies of the kidney in elderly patients. The kidneys present some important morphologic changes according to the patient’s age, which can be detected first by grayscale ultrasound (US) and color Doppler US and second by all the other imaging modalities. These changes have an impact on patient management, particularly with respect to pharmacologic therapy. The fundamental alterations of renal morphology in elderly patients include size reduction, parenchymal thickness reduction, margin irregularities due to nephroangiosclerosis of the intrarenal arteries, and increased corticomedullary differentiation. The main renal pathologies, including vascular and tumoral diseases, present some peculiar features in elderly patients.